Individual scripts or websites are sometimes defective and hang, or an add-on in the browser starts giving problems. Restarting the browser is what you usually need to do. Chrome is the first browser to introduce a consistent separation of individual tabs at the process level. You can check that when you start the task manager with many tabs open in the browser. Press the key combination [Ctrl]+[Shift]+[Esc] and switch to the ‘Processes’ tab. 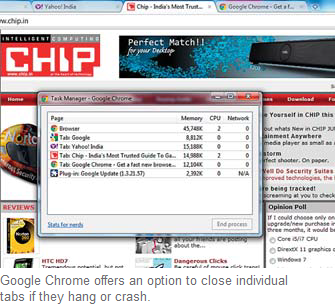 For instance, if there are four tabs open, you will see the ‘chrome.exe’ process displayed at least five times. You can end the processes here itself but you cant see which process entry belongs to which tab. It is this information that the internal task manager of Chrome provides. You can call it up from the Chrome program window either by pressing the key combination [Shift]+[Esc] or by right clicking a free spot above the address bar and selecting the context command ‘Task Manager’. The following dialog shows the tab or plug-in to which the process is correlated. Select the desired entry and click ‘End process’. You can call up detailed information about memory usage of individual processes via the link ‘Statistics for nerds’ and thus identify which websites are low on memory. Moreover, the overview also shows the memory requirements of all other currently open browsers. You can thus end a hanging Flash Player without problems or close a tab with defective websites without affecting the remaining browsers. The closed page displays a message in the tab, thus enabling immediate reloading of the page.